Are you ready to become a master connector? Each week Dave Lorenzo interviews a business leader who knows how to grow revenue with relationship sales. He does this on his YouTube Show titled Do This Sell More. The show is also released as a podcast. This week Dave interviews master connector and best selling author Lou Diamond. The most effective way to sell. Understanding the people we are trying to sell to and how we can best help them. The critical mistake not to make when you’re looking to connect. The excess of screen time is affecting not only our eyes, but also our souls. The only person that matters in the room is the person that you are pitching and connecting to. The most successful people are the ones that prepare the most. Dave Lorenzo: This is the Do This Sell More Show. I’m your host, Dave Lorenzo. Today, it is my honor to welcome Mr. Lou Diamond to the show. Let me tell you a little bit about Lou. I’m going to read it, so that I don’t miss out on anything that’s critically important. Lou Diamond is the Master Connector. He has over a quarter of a century of experience in sales, relationship management, business development and executive mentoring. He’s an international keynote speaker. He’s a consultant. He consults on leadership and performance and he mentors people on the same. He’s a bestselling author. He has a Podcast. He’s also a TV host and the CEO of THRIVE. Dave Lorenzo: Now, that’s a company focused on marketing the most amazing people, businesses and brands. He helps them become even more amazing through the power of connecting. Welcome to the show, Mr. Lou Diamond. Lou Diamond: Dave Lorenzo. Absolutely an honor to be here. So much so that I broke out the cowboy hat. Dave Lorenzo: Fantastic. Lou, I love the art of connecting. Can you give the folks, who are listening … The people who are listening are probably, I would say they’re independent professionals. They are folks who are in B2B sales. So talk about connecting and talk about … Tell us how that’s helped you in your career. Lou Diamond: To simply put it, I think as you mentioned, the name of the company, something magical happens when you have a connection with someone. You truly, as I like to say, thrive. You can’t thrive unless you connect. So many people don’t actually know exactly how to connect. We live in a world today, Dave, where we have so much screen time, it’s affecting not only our eyes but our souls. Everyone is craving connection. It turns out that, what I’ve always been about, is that we actually have “muscles”. I’m putting that in quotes here. That are how you need to be, to be a better connector. 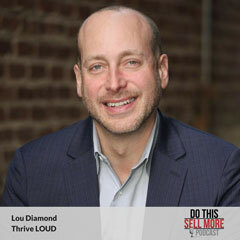 Lou Diamond: Whether it’s yourself, as an individual trying to connect, if it’s a sales or maybe you’re trying to get a job interview or connect yourself or connect your message to raise money or funds to get your story out. If you’re a leader to connect with the people that work in your organization. If you’re a company and you want your message to connect with your end audience. There are skills that you can work on, that I call your connecting core. You can actually learn and coach and work on every single day to help develop those skills to connect better. Dave Lorenzo: Alright, give us an example of some of the skills. Tell us what we can do to improve them. Lou Diamond: Let’s start out with one of my favorite ones, which is really simple. One of the muscles is the power of empathy. Lou Diamond: Too often, and if you’ve seen this, some people come in with a capabilities presentation about their company and all the great things that they can do. What I’m great at, what my company does. I always loved that thing, Dave, where people show the logo slide. They lead with, here are all the great companies that we have worked with, that aren’t you. At the end of the day, the only person that matters in the room is the person that you’re pitching and connecting to. I love to make the expression that we are never in the business of selling. I know this is the strategic sales academy and Do This Sell More. But the reality is the most effective way to sell is to help somebody buy. To do that, we need to stand in the shoes of another, to see things from their world, so that we understand as a partner with that potential partner, how we can help them, not how you’re going to help yourself. Lou Diamond: A lot of that is the way that we listen. We do this by asking great questions. We do this by truly seeing things from their point of view. That’s actually called listening level two, which is a focused listening that nothing else matters, but the partner that you’re working with. The ability to get out of your own ego and jump in and step in and sell from a point of view, where you’re helping them to buy. That is a key muscle and the power of empathy that I work on them. One of the many other ones, that are out there in the connecting core. Helpful? Dave Lorenzo: Fantastic. We’re talking with Lou Diamond. Lou is the Master Connector. Lou’s helping us make connections in a way that are absolutely real. One of the things, Lou, that I focus on, with my clients, is relationship development. Help our listeners, help me with developing relationships. How do we get started? In a sales environment, people are always going to be skeptical. They put up that wall. They put up that barrier. I want to be empathetic. I want to connect. Tell me how I can do that, at the outset, when they know I’m there and they know I make my money by selling a product or a service. Lou Diamond: I think the most important way to start out is simply put, and I started to say this, to ask great questions. If you’re looking to find out what somebody does or what their business does, you really understand, hey listen, we’re in the world of helping people from a marketing perspective. We have a technology offering. What I want to understand right now, is the current world that you have. Let’s say you’re trying to offer a technology solution that’s going to help someone’s business. Let’s understand what their business is about. What their goals are, first. Ask them those questions. What are you trying to get this year? It’s the beginning of the year that we’re recording this? What are we looking for for our goals for this year? Were you happy with what you had from last year? What’s been keeping you up at night? Lou Diamond: What are the things that you need the most help with? Let me see if I can help you in that area. Here’s the most important part. If you start having a conversation with someone and they’re not letting you in and they’re not opening up, well first of all, physically start opening up. When you went to connect with someone, you got to let yourself open and be like this. Like physically, if you can see me here, open to the person that you’re connecting to. If they’re reserved and being like this, there’s actually a mirroring reaction that you’re looking for. What you want to try to do is to get them to open up a little, too. That’s where connection begins. If they’re not willing to do this, this is important. Some people aren’t ready to connect. You have to approach them at a time that is the most appropriate for them to do it. Trying to make a connection, let’s say in a big trade hall and a conference center or a trade show, is a very challenging thing to do. Lou Diamond: Dave, I like to think of it as what’s the most appropriate situation that they like to connect in and get them comfortable. It might not be your comfort zone, but find out where they’re the most comfortable and where they feel open to share, so that you can understand what their world was about. Dave Lorenzo: All right, great advice. We’re speaking with Lou Diamond. He’s the Master Connector and the name of his company is THRIVE. Lou, tell me, is there anything, what’s the one thing I shouldn’t do? What’s the critical mistake I shouldn’t make, when I’m looking to connect? Lou Diamond: I want to make this clear. For those that are going to conferences or trade shows and they’ve got a stack of business cards, this high and you’re so tempted to give out these business cards, I want to make this clear. If you lead by giving out your business card, you are not connecting. You might be networking or following up in some way, but if you start to give someone something because you feel you need to give that to them, the only reason you should ever give your information is because you’ve connected with someone and that person asks for it. That’s asking permission. Where they say, what’s the best way for me to get in contact with you? You know when this logical point happens. How often have you ever come to a situation somebody meets you, and the first thing they say, here, take my card. Lou Diamond: Nobody wants to take a card. I don’t want to. I don’t want to throw it right in the garbage. I want to know why I’d be taking that card. What is the world that you’re going to do this? If someone says, listen, I really want to follow up with you. I want to learn more. Lou, what’s the best way for us to get in contact? Now, until you’ve made that connection, that’s when you have the permission to go do so. A great taboo thing that you should avoid if you come home from a trade show, a networking meeting, an opportunity to promote your own business with 50 business cards, you really should be questioning the amount that you got. But, if you have the ones that you received, that really were the people that you followed up with. Take a pen, write down on the card that specific item that you did. Lou Diamond: Good colleague of mine, David Newman, who’s been in the business for a long time. David and I had this piece where we met at a trade show, at a conference, I think it was actually a conference in Dallas, and the first thing he did was he says, can I have your card? He wrote down specifically the reason he wanted to follow up with me. When he got back to me, did something amazing. He did one of those video and BombBomb things where you sent the message and he’s reading the card. He goes, I remembered this conversation. I wanted to get a face to face to continue our conversation. What makes the most sense for you? Great way to connect with another individual. Dave Lorenzo: Fantastic, excellent advice. Lou Diamond is the Master Connector. His website is thriveloud altogether. T H R I V E L O U D.com. I’m going to put the link in the show notes to his website. Also put a link to his book on the website in the show notes and on YouTube. If you’re watching this on YouTube when Lou said you have to have open body language, he was talking about having your arms spread at a normal distance, not standing at attention like a soldier. When he said that your body language was more guarded, he had his arms crossed in front of him, as if he was cold and he was shivering. That’s what you don’t want. Dave Lorenzo: Lou, tell me about prospecting in your system and in what you teach. How do you teach your clients, cause I know you work with a lot of clients, you work with big businesses. Tell me how you teach people to go out and prospect without coming across from a standpoint of being empathetic, from a standpoint of wanting to develop a relationship. How do they prospect? Is it just cold calling, but they do it in a different way? What advice do you give people, when it comes to prospecting? Lou Diamond: I think it’s very important to remember that the most successful people are the ones that prepare the most. If you know you’re going to an event and a trade show, get the list of the people that are coming to the event and identify and highlight the ones you want to see. If you have a target list of clients you want to go after, there’s amazing resources out there from LinkedIn, the Internet, everywhere you go, where you can research and get information ahead of time, so that you can be as smart as you can and prepare. I love to say, Dave, everything that I’m about is either before the pitch, as it relates to building that prospecting. What are the things you need to do before you ever walk into a room to pitch? In fact, the pitch should almost be a regular conversation that you’ve already partnered with them, because you’ve done so much great connecting, strategizing, and follow through before you ever even got in the sales room with them. Lou Diamond: As it relates to prospecting, you can’t take away, you need a little elbow grease and hard work. You got to do the work. It is a little bit of a numbers game, like anything else. You’re going to have to go after 10 prospects, to get one or two real ones that are out there. Use effective messaging and something that’s customized to the specific target you’re going after. People are tired. I will say this, there’s nothing more irritating. I don’t have my phone here, I don’t know where it went, but I was going to pick up my phone. Every morning I wake up, there’s seven or eight LinkedIn cold call requests for me, right? This is not connecting. By the way, I find this almost a waste of time. You might have a success rate, but you’re not successfully going after those that need what you need. Lou Diamond: Getting a customized response from somebody is a true effort to understand what their needs are. I’ve just read this article about you on LinkedIn or in some place in business where you just had activity. We’ve done something similar with another organization. I’d love the opportunity to follow up with you. That message can’t go to every single one. That’s the effort you need to do, to make sure that you customize as you prospect. The reason I stress this is, you can’t come off as connecting if you’re just blasting out and behaving in the way that you email, you market, even you phone call, picking up the calls, you have to have that specific customized response within the prospect thing. It’s extra work, but that level of preparation increases the likelihood that you’re pitching and you’re going to close more successfully. Dave Lorenzo: Okay, fantastic. Great advice, Lou. Now let’s shift to high net worth individuals. If I’m a financial advisor and I’m established in my career, maybe I’m 15 or 20 years in, and I’m doing well. I deepened my relationships with my clients and I got that down. Now I’m looking for bigger fish. I’m hunting for bigger game. What do I do? Is it any different when I’m going after high net worth individuals versus individual product sales? Is the approach any different? Lou Diamond: In theory, no. But, in the specifics of high net worth individuals understands people like … I always liked to say that there’s the analogy, think of the car that you want. What’s the image that you want to present of yourself? Think of it as a car. Are you the person driving the Mercedes? That’s what people want to aspire and attract to. Keep in mind that when you’re dealing with high net worth individuals, coming up with a beat up Chevy, that type of way that you dress, the way that you look. I forgot that we were going to be on camera today. That’s why it came straight from the gym and put on a cowboy hat. But, in the messaging of working with high net worth individuals, it is important to understand, to put them in the comfort zone that they’re most comfortable with. Lou Diamond: I like to do the research of these people. We have a lot of people, who grew up traditionally, your suit and tie folks, who have a certain brand of how it works for their financial matching and what they expect to see on the other end. If you’re catering to that, you have to look like that. You have to act the part, you have to speak the part, and you have to know their business. How you can help with people. It’s very difficult if the clients that you’re working with, are not in that space and you’re trying to message that up to play in that space. I know that’s a big challenge, but as you move your way up, you have to figure out the ways that work, to who you are and how to balance it. Once you’re there and you’re dealing with it, you’re a very comfortable person to work with. Connecting is as similar as it is to every other level. It doesn’t matter what your net worth is, it’s just understanding specifically, how you can help them on their needs. Dave Lorenzo: Fantastic. Thank you. Lou. Tell me, real quick, last question I have for you. Then we’ll talk a little bit about you and what you have going on. Tell me about you and how you’re comfortable when somebody pitches you, or when somebody sells you. How you like people to approach you with new ideas or new products or new services? Lou Diamond: In the same way that I want. I want them asking me as many questions as possible. I want them to step into my shoes. See things from my perspective. Most importantly not flip it back and have them tell me, well, let me tell you what I’m doing. There’s nothing more distasteful in that piece. I’m like, well, I’m not you. Tell me how you could step into my shoes and know what I’m about. By doing that, asking the right questions, where am I right now? What are my current needs and problems? Help me by, is really what I’m looking for. Those that do that well, understand my goals and my immediate aspirations, for what I’m trying to get to and if they can solve the problem. The best sales technique I’d ever seen in my life for someone trying to connect with me, was they heard where I was at and there wasn’t exactly a match. The best thing that individual said is, I’m not at that stage with you right now. Lou Diamond: I can’t help you here. Here’s who can. Here’s the best part, I’ve probably recommended more people to that individual, who did not take on my business because they knew they couldn’t help me at that time. That is truly understanding who your customer is. I love the expression, Dave, get to no faster. If you’re working with somebody and you recognize right away, that it’s not going to happen, get to no and say, listen, this is not, no or not yet. I’m not there yet with you. I’m not going to be able to be the one to help you, but when you get to this part, I’m your man. I’m your woman. I’m the person who’s going to be able to help you, at that stage. Dave Lorenzo: That’s fantastic. Great Advice. Get to no faster. I love that. Alright, Lou, so tell us now about you. Dave Lorenzo: Tell us how we can help you. First, tell us about the book. Where can people get the book? Then tell us about your company and you’re speaking. Lou Diamond: If you want to get the book, learn about speaking, you can either go to loudiamond.net or to thriveloud.com either one. The book is Master the Art of Connecting. We have links on all of that. It sells on Amazon. It’s been a best seller. It continues to come out. We’re actually coming out with the audio book later this year. There are two more books coming out within the near future, towards the end of the year. Be on the lookout for Before the Pitch. That’s coming out, probably in the fall. As for me speaking, go to loudiamond.net. You can get all the information, videos, me speaking, working with you. If you’re looking to figure out all the things you need to do, to prepare your sales team, to propel your organization, I come in, I speak to companies, organizations, and trade shows. Lou Diamond: I do this big conversation, Dave, about connect working, which is to kick off a lot of these large trade shows, on how you need to be at the trade show, so that you can maximize that event the most. It’s a nice kickoff for all the conferences that you go to and helping people to maximize their time there. They can connect with the right people in that environment when they’re there. Dave Lorenzo: That’s something that a company would bring you in to do before they had folks going out to a trade show, right? Dave Lorenzo: To start the event. Okay. Lou Diamond: To start the event. Hey, you’ve got this incredible roster of events to do. Let me tell you how you’re going to maximize this trade show. The best way for you to behave when you’re there. It’s a great way to … You’ve come to the event, you want to make it the most useful for yourself. This is the best way to utilize it that way. The other thing I guess we can promote, if you go to THRIVE Loud, you could also go to another show. Which I’m sure one day, we’ll have the Dave Lorenzo on, on the thriveloud.com to check it out. Another fun show to learn how people are thriving in their lives, their businesses, and their passions, through the power of connecting. Dave Lorenzo: Alright, so it’s loudiamond.net and thriveloud.com, T H R I V E L O U D.com, thrive loud.com for all things Lou Diamond. He’s the Master Connector. He gave us just a few minutes of fantastic advice here. If you go to his website or you book him to speak, I’m sure you will get a fire hose of advice. It’ll just come out all over you, like drinking from a fire hose. Lou Diamond, the Master Connector. I am deeply appreciative for you being on the show. Thank you for giving us your time today. This is the Do This Sell More Show. Lou gave us so much, that you can do and sell more. I look forward to seeing you right back here, next week. I’m Dave Lorenzo. Between now and then, make sure you Do This and Sell More. Lou Diamond is THE Master Connector. He has over a quarter century of experience in sales, relationship management, business development and executive coaching. Lou is an International Speaker, Motivator, Consultant, Coach, and Best-selling Author. He was a top producer for Accenture, Deloitte, Omnicom, Merrill Lynch and Bank of America, leading teams to achieve record revenues year after year. Lou is the CEO and founder of THRIVE, a leading consulting and coaching firm focused on making the most incredible leaders, performers and companies even more amazing. He hosts Thrive LOUD, one of the most popular business podcast shows dedicated to inspiring people to reach their peak potential in every facet of their life. Lou has consulted, mentored and presented to leading performers at hundreds of companies across the globe. His authenticity, energy and enthusiasm, along with his unwavering passion and desire for helping people achieve their business and personal goals, is unmatched.